The Jesuits say ‘give me a child until they are seven and I will show you the man’, or woman of course. When I was seven I spent my time making up impossibly large families in ‘my famerley book’ (spelling was not a strong point). I also wrote long stories or played complicated, extended games of schools. Although I enjoyed ‘dressing up’, I hadn’t yet started donning period costume but most other aspects of my current life were there in embryonic form. Although I have, I hope, a reputation as an academic historian, I believe good history is for everyone. As The History Interpreter, I aim to bring history alive in a variety of ways. I am passionate about encouraging young people to become interested in the past, especially through living history or family history. Many of my ideas are shared in my booklet Harnessing the Facebook Generation: ideas for involving young people in family history and heritage. 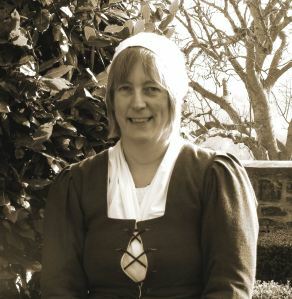 I spend part of my time as my alter ego, Mistress Agnes, living in the sixteenth and seventeenth centuries, managing the Swords and Spindles team of historical interpreters. My social history book Coffers, Clysters, Comfrey and Coifs: the lives of our seventeenth century ancestors, emerged out of this experience. I am particularly interested in the role of women in the past and helped eighty ladies recall their memories of the pivotal period 1946-1969. These have been merged together in Remember Then: women’s memories of 1946-1969 and how to write your own. Recently, I was persuaded to return to fiction writing, something that I had not done since my angst-ridden teenage years. Blue Poppy Publishing will be launching Barefoot on the Cobbles on 17 November 2018. Inevitably the novel is set in the past, in this case in the early years of the twentieth century. The story is based on a real tragedy that lay hidden for nearly a century and includes murder, shipwrecks, disease and some lighter moments! Rooted in its unique and beautiful geographical setting, here is the unfolding of a past that reverberates unhappily through the decades and of raw emotions that are surprisingly modern in character. I enjoy dissecting small, rural communities and trying to understand how they functioned in the past. In this respect, I maintain my own one place studies for the North Devon villages of Buckland Brewer, Bucks Mills and Bulkworthy. No, I am not working my way through the alphabet! I am a founder member and former chair of the Society for One-Place Studies and I have written a guide to that peculiar blend of local and family history that is one place studies Putting Your Ancestors in their Place. I also research my own family history, with an emphasis on putting the lives of my ancestors into a wider context. I am responsible for the latest edition of the classic family history handbook Family Historian’s Enquire Within. I teach family and local history classes and am a tutor for Pharos Teaching and Tutoring Ltd. who offer a range of online genealogical courses. I am also a columnist for The In-Depth Genealogist Magazine. I work closely with historical organisations in my home county of Devon and I am leader of the North Devon group of Devon Family History Society. The Isle of Wight Family History Society have done me the honour of appointing me one of their vice-presidents. As historian for The Braund Family History Society I have immersed myself in the origins, genealogy and biography of this west country family and have written several books about them. I am also a long-standing member of the Guild of One-Name Studies and their regional representative for Cornwall. 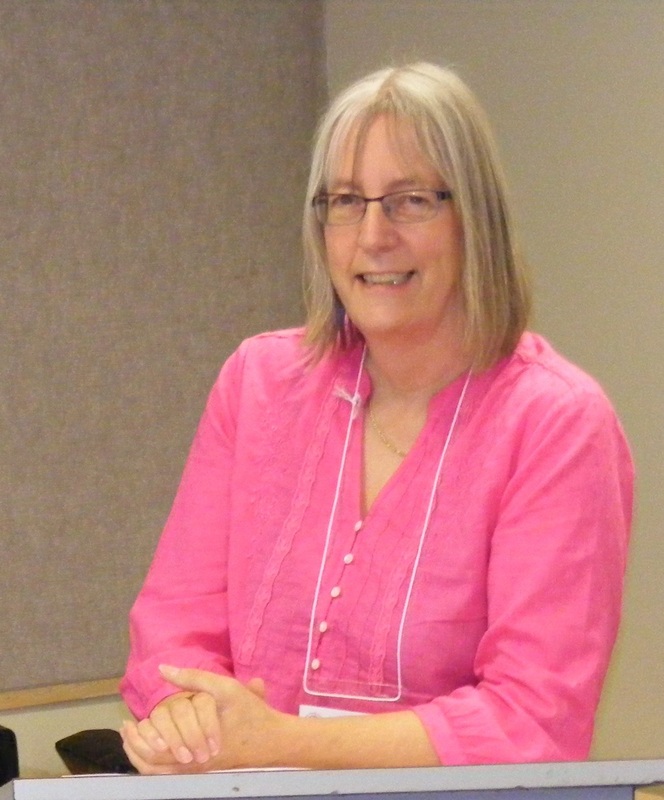 You can read about my chaotic historical life on the blog at Latest News from the History Interpreter. Here you will find my ramblings about history, genealogy and writing, as well as accounts of my various travels hither and yon. Do click ‘follow’ if you want to keep up to date. You can also follow me on Twitter @janetfew but beware, I have no idea where I am going. I always reply to emails but am aware that some do get lost in the ether. If you do not receive a response within 48 hours please try again. The material, both written and photographic, on these pages is the copyright of Janet Few unless stated. Text and illustrations on this site may be used for personal reference only. If you wish to use any of the material on this site for other purposes, please seek the written permission of Janet Few © 2012-2019. Streets can be tricky, especially pre 1841 census, as all you can often tell is that the person was living in a parish and not specifically in which street. I’m afraid no one has come up with the magic answer but we can discuss this further in Torrington. Hi Janet, re: the storm of 1838, you are no doubt aware that Charles Kingsley author of The Water Baby’s who lived in Clovelly wrote a famous poem called ‘The Three Fishers’ made into a folk song. This is thought to refer possibly to three members of the BRITTON family whose body’s were washed up after the storm. This particular line of the Britton family came from Hartland originally. And Dan Britton who has researched this has collected some information about the disaster. He is a musician who has or is in a band called Govannen & has sung a version of the three fishers which can be found YouTube. There is also a famous painting by called “For men must work and women must weep” a refrain from the poem “The three Fishers” by Walter Langley which I unknowingly I recall at a recent exhibition at the Tate Britain on watercolour painting! A fine Victorian work, Dan Britton also has a website. thebrittonfamilysite.wix.com. In which he has drawn together some of the details he knows. I am from a different branch of the Britton family and at the moment cannot trace a link to Dans ancestors. My father wrote a book about our family and we can trace our ancestors back to an Adam Britton born in Ilfracombe on July 16th 1550. We boast an early Photographer William Britton who had a shop in Barnstaple and married the daughter of Thomas Branham, Mary Jane sister to the famous Art potter Charles Branham who worked in Williams photography business for a while. I’m also related by marriage to a family who own Blackgang Chine on the isle of White and have records of their family – the Dabells if you are interested. Of your family I’m afraid I know nothing but intermarriages in these parts means that Devon families are all likely to be related? First off Lois are you related to the families from Fletcher Road in Hamilton? I am also related to the Bale/Fulford lines. I have Batholomew Fulford married Harriet Bale and she died young. Then he married Harriet’s sister Prudence. What I was trying to find out is if a photo studio in Brighton Ontario were related to the Fulford Brothers dry goods store in Port Hope Ontario. i found a picture for sale on ebay that had the logo on it “Fulford”. I know that Fulford brothers that owned the dry goods store is of my Bale/Fulford line. I was wondering if anyone knows this info. Dear Janet, would you mind sending me an email, as I would like to invite you to do a webinar with the Society of Australian Genealogists sometime. Thanks so much, Deborah. Hello Deborah – I tried emailing you – you can get me on historyinterpreter@hotmail.co.uk. For the past two years I have been researching my great-grandmother’s family (Moseley and her husband-Richards.) I’ve now started on her daughter’s (my grandmother’s husband-Fletcher) only to learn that they, too were born in the Birmingham area. I’ll be making my first trip to Birmingham/Walsall in 2015 I am so intrigued by your focus on the “times” they lived in because my research also includes stories, so my work goes beyond simply “dates” in reference to their lives. I will subscribe to your blog and am very interested in knowing how you charge for your own research on other’s families. I was born in Hamilton, Ontario, Canada and now live in Sherman Oaks in southern California. I guess you could say I’m now obsessed with my maternal and paternal family histories and have been interviewing family members and scanning lots of old photographs for the books I’m writing. I am so happy to have bumped into you on Facebook. Thank you Lois. I hope your trip goes well next year. I usually research families from Devon and Cornwall for those who are unable to do it themselves. If you were thinking of getting someone over here to help you I’d take a look at http://www.agra.org.uk/ to see who offers these services in the areas where your ancestors originate. I’m intrigued! I love period clothing, but my acting skills are non-existent. I look forward to reading more. I’m looking forward to reading more, Janet – I enjoy your tweets already. Welcome to the wonderful world of genealogy blogging! It’s Memorial Day here in the USA. Memorial Day is a day to remember those who fought and died in the service of the United States. My ancestor, John D. Laurie fought with the 10th Connecticut Infantry. He died during the war of wounds he received. A cricketing friend of mine in Chch descends from a James SANDERS who played rugby league for NZ. James appears to have had siblings Frank and May, all three born born to John SANDERS (=Mary WEIR?) who died 1904 age 33, the son of William SANDERS (=Mary) who probably died 1911 age 82 at Christchurch. John & William are buried in the same plot at Addington cemetery, Christchurch. A lot of graves at Addington were damaged by the earthquakes. I’m thinking that William might be William SAUNDERS age 30 who arrived at Lyttelton the port of Christchurch in early 1860 on the ship ROBERT SMALL with his wife Mary age 30 and children Thomas age 5 and Sidney age 2 weeks (might have been age 2 wks at the start of the voyage). William SAUNDERS was a miner from Gloucestershire. A William & Mary SANDERS had issue Hester Ellen 1862, Emily 1865 and John 1870 whom I think was the father of james the league player. William’s wife Mary died 1892 at Pigeon Lane (now Clarence Street), Christchurch age 63. A Sydney SANDERS married Alma WILLISCROFT and had a son William Sydney SANDERS who married Violet TRUSTRUM. Have been a follower for twelve years now. Can vouch first hand for your untiring devotion to family history. Thank you for all the help extended our way for the completion of our family tree. Fourteen years ago I did not know anymore than my great-grand father’s name. Then I received an unsolicited e-mail from The History Interpreter, Now, I can go back six and seven generations. Wish I could be with you this week for the reunion. Love ya! Wow! Janet, I had no idea of all the things you were into. This site has been bookmarked and I will visit often. I was really interested to see your connection to the Isle of Wight as I have been doing some research there recently. I’ll be in touch with you about that.